Call them pancakes, flapjacks, hot cakes, whatever, our family eats pancakes. If we have time, we try to make pancakes on the weekend. We’ve always used a silicon spatula but recently, I destroyed it (I think time did, but I’ll take the blame). A trip to a local kitchen store introduced me to the Oxo Good Grips Pancake Turner. I liked that it was made of silicon but I was unsure of its design. It seemed awfully big for a pancake turner but I thought I’d give it a try. After all, how can thingsthatwedo.com be a blog review site if I don’t try things out for you? 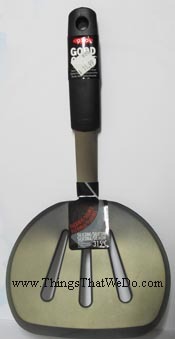 I bring home the humungous Oxo pancake turner and the minute the husband saw it, he complained that it was too big. See, I’m not the only one. But, nonetheless, I persevered and tried it out on pancakes and omelettes the next day. I used the Oxo Good Grips pancake turner in 2 different pans, one was a wider ceramic wok like pan, the other a slightly smaller stainless steel pan. I have to finally agree with the husband that this Oxo Good Grips pancake turner isn’t ideal for all pans. Its large size condemns it to only large size pans because I had a great time turning those pancakes in the ceramic wok. In fact, I made small pancakes so I was able to turn 2 at once. I don’t think I’ve ever made pancakes that fast before! Then came the task of making the omelette in the other stainless steel pan and yeah, that wasn’t so fun. It was really awkward trying to use the Oxo Good Grips pancake turner to navigate around and flip that omelette. In theory, I suppose, so long as it’s good at flipping pancakes that should suffice right? But, then again, if I’m going to keep a big thing like that around, I’d want it to be able to do a variety of tasks in the kitchen. You also need to know that the handle is shorter which I think is intended to give you better control and grip when you turn. 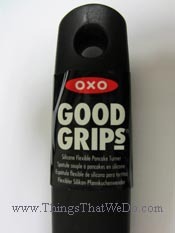 Would I get this Oxo Good Grips pancake turner for a friend? I’m not sure. It does feel sturdy and hefty and it fits comfortably in my hand but I do wish it wasn’t so awkward. The husband still thinks it’s a ridiculous looking gadget and refuses to use it. 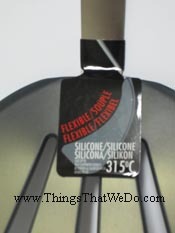 Right now, my half broken silicon spatula seems more functional than this product but who knows? Maybe I just haven’t figured out how to use it yet. If and when I do, I’ll certainly update you all on my progress. For the meantime, this product in my opinion, needs a slight revamp. Otherwise, some wonderful family member needs to buy me a whole new set of pots and pans! Like this review by thingsthatwedo.com? Let others know: Tweet it!